The whole country was listening on Election Night, 2008, as then President-elect Barack Obama stood in front of a crowd of thousands in Chicago’s Grant Park and told his daughters, Sasha and Malia, he would follow through with the promise he made them about adding a dog to the family. It seemed every dog lover in the U.S. was waiting with bated breath, speculating as to the breed and name of the future First Dog before the family decided on Bo. Bo (left) was given to the Obamas by Sen. Ted Kennedy in 2009; Sunny was added to the family on August 19, 2013. Now, four years and another term later, the Obamas are pleased to welcome another four-legged friend to the family — a fluffy girl named Sunny! Like Bo, Sunny is a purebred Portuguese Water Dog — a perfect pick for the First Family, who suffer from allergies. While Portuguese Water Dogs aren’t exactly hypoallergenic, as there really is no such thing as an entirely hypoallergenic dog, the breed sheds very little hair and dander, making it a good choice for those who usually get a bit sneezy and sniffly around canines. Born in Michigan in June 2012, 1-year-old Sunny made her White House debut August 19. According to the White House, Sunny makes a wonderful addition to the Obama family, and will make an especially good companion for Bo. “Sunny is the perfect little sister for Bo — full of energy and very affectionate,” the official announcement on WhiteHouse.gov reads. The President couldn’t resist sharing a photo of Sunny on his Twitter account. “Welcome to the family, Sunny,” the photo’s caption reads. 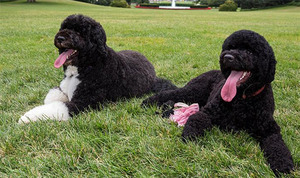 First Lady Michelle Obama also took to her Twitter feed yesterday evening with a cute photo of Sunny hanging out on the White House lawn with her Portie brother, Bo. “So excited to introduce the newest member of the Obama family — our puppy, Sunny!” the FLOTUS writes. In honor of their family’s new addition, the Obamas plan to make an undisclosed contribution to the Washington Humane Society in Sunny’s name. So does that make Sunny the “Second Dog”?